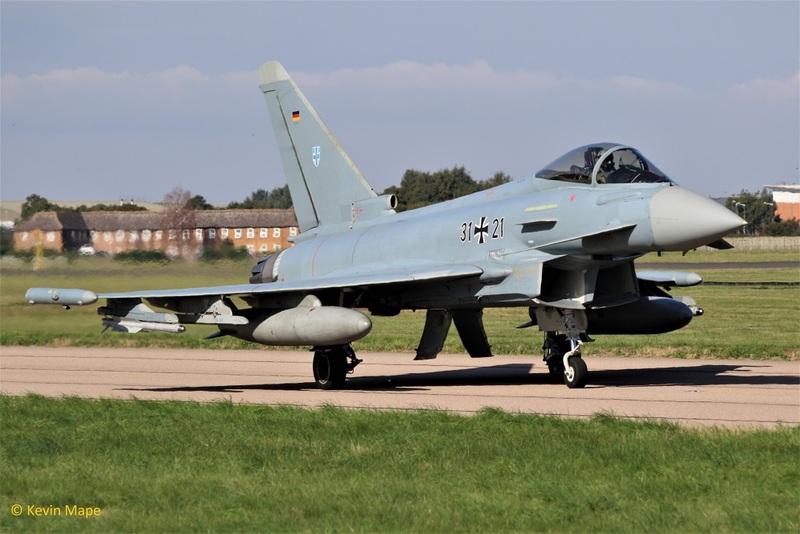 Exercise ” Cobra Warrior ” will run from the 3rd until the 24th September, a joint RAF and Luftwaffe exercise with German Eurofighter and Tornado operating out of Coningsby. I am expecting a very busy month. 30+73/TLG 73- Arrived as “GAF 001D” – Steinhoff special tail. 30+84/TLG73 – Arrived as “GAF 001A” 31/8/18. 43+25/TLG51– Arrived as “GAF M 52” 31/8/18. 43+97/TLG51– Arrived as “GAF M 53” 31/8/18. – Departed as “GAF M 51” 5/9/18. 45+39/TLG51– Arrived as “GAF M 54” 31/8/18. Departed as GAF M51 12/9/18. 46+44/TLG51– Arrived as “GAF M 51” 31/8/18. 46+35/TLG51 – Arrived as “GAF M 55” 31/8/18. 46+36/TLG51 – Arrived as “GAF M 56” 31/8/18. 46+40/TLG 51 – Arrived as “GAF M51” 5/9/18. 46+55/TLG 51 – Arrived as “GAF M51” 12/9/18. I will add the aircraft change overs as they happen. ZA607/EB-X/41(R)TES / Tornado GR4 c/s “Marham 10” – Overshoot. 30+73/TLG73/EF2000A c/s “Scare 12″” – Steinhoff special tail. 4th Tue Log thanks to Steve & Val and Rob W.
ZK353/353 code only – Noted on the Wash pan. 46+23/TLG 51/Tornado ECR c/s “German Air Force Mike 51” – Parked on the ASP. ZK357/357 code only c/s “Razor 11″ – Armed with 1 live Paveway IV. ZK304/304 code only c/s “Razor 12” – Armed with 1 live Paveway IV. 5th Wed Log thanks to Susie & Rob W.
ZK331/331 code only – noted on the Wash pan. ZK348/348 code only – noted on tow. 46+40/TLG 51/Tornado ECR c/s “GAF Mike 51” – New arrival. 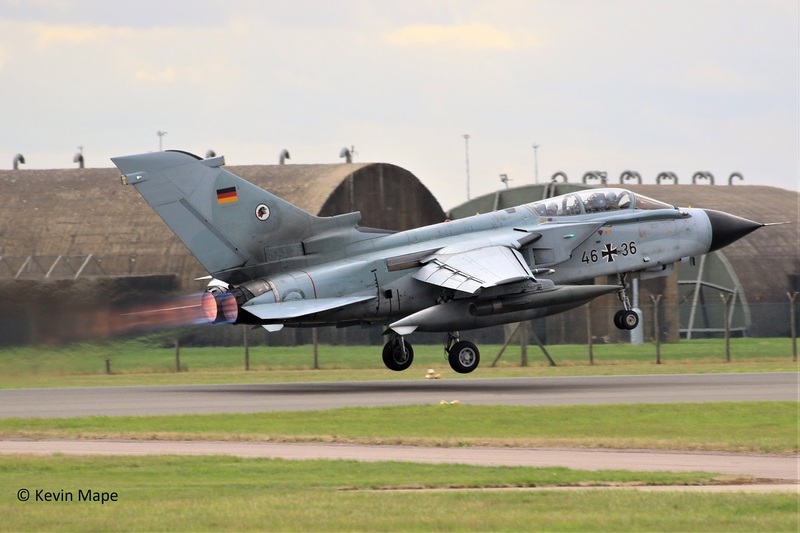 43+97/TLG51/Tornado IDS c/s “GAF Mike 51” – returned to Germany. 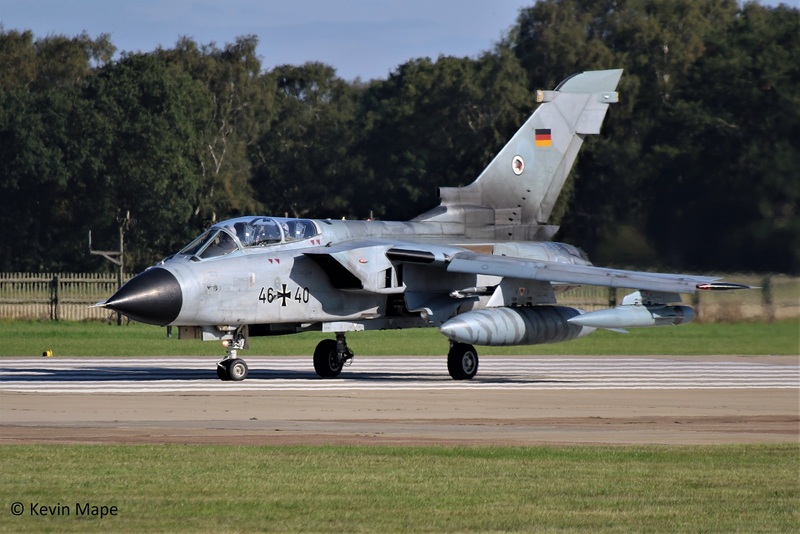 45+39/TLG51/Tornado IDS – Towed to Compass swing area for Engine run. 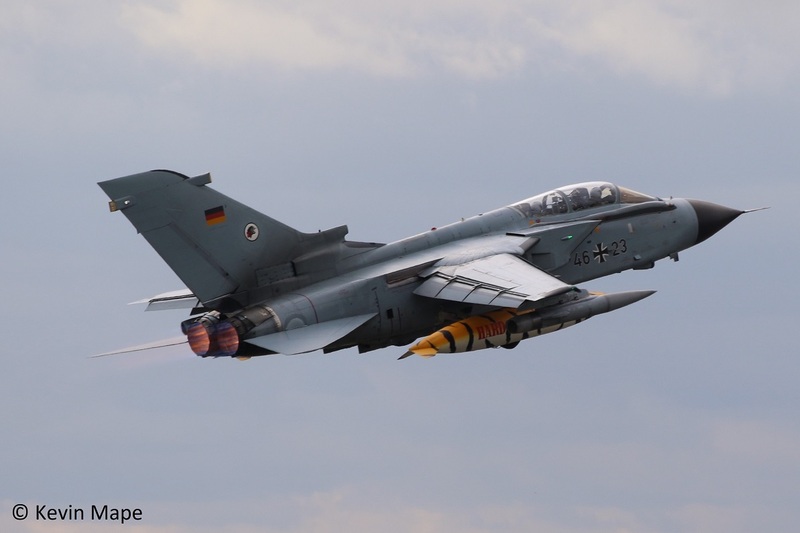 ZA553/045 code only /Tornado GR4 c/s “Maraham 17” – Overshoot. 30+73/TLG 73/EF2000A c/s “Covert 2” – Special tail. ZK304/304/XI(F)Sqn c/s “Razor 11” – Armed with one live Paveway IV. ZK341/341 code only c/s “Razor 12”- Armed with one live Paveway IV. ZK346/346 code only c/s “Havoc 21” – Armed with one live Paveway IV. ZK357/357 code only c/s “Havoc 22”- Armed with one live Paveway IV. 6th Thur Log thanks to Garf & Rob W.
7th Fri Log thanks to Rob W.
ZF342/342/1FTS/Tucano T1 c/s ” LOP 11 “- Overshoot. 43+25/TLG 51/Tornado ECR c/s “Harpoon 26” – Ground abort. ZK317/317 code only c/s “Rafair 7001”- return from Belgium. 11th Tue Log thanks to Steve & Val. ZF172/172/1FTS/Tucano T1 c/s “Lima 03” – touch & go. ZK365/365/41(R)Sqn c/s “Rebel 89” – To Holbeach. ZK361/361 code only – To HAS 1 for – QRA duty. ZK374/Unmarked – Noted on the ASP. 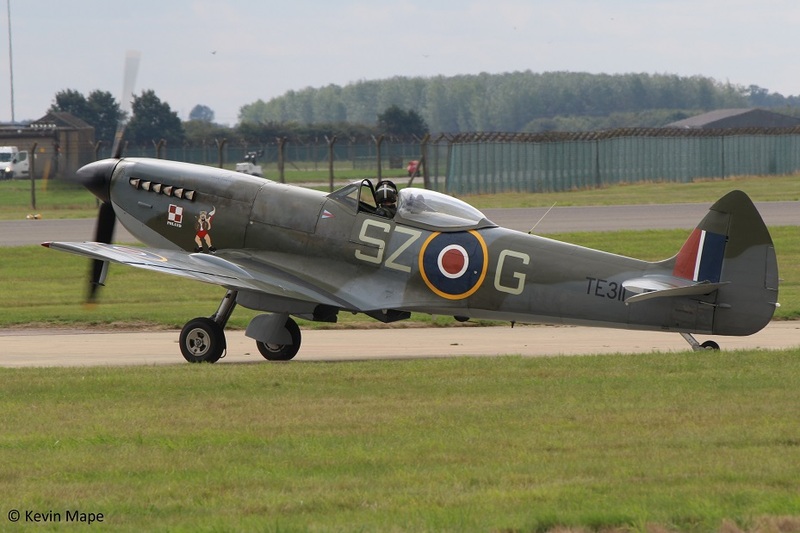 TE311/SZ-G/BBMF/Spitfire LF XVIe – outside BBMF. PA474/BBMF/Lancaster B1 – outside BBMF. ZK361/361 code only – From HAS 1 to HAS 4 for – QRA duty. ZK361/361 code only – QRA radio check. ZK331/331 code only c/s “Razor 11” – Armed with 2 live Paveway IV. ZK304/304/XI(F)Sqn c/s “Razor 12”- Armed with 2 live Paveway IV. ZM317/3FTS/Prefect T1 c/s “Barkston 88” – Overshoot. ZM147/617Sqn/F-35B Lightning II c/s “Marham 88” – Overshoot. TE311/SZ-G/BBMF/Spitfire LF XVI c/s “Spitfire 90” – Test flight. 12th Wed Log thanks to Rich (AM) & Susie (PM). G-MAJD/Eastern/Jetstream 41 c/s “East flt 102” in “103” out. 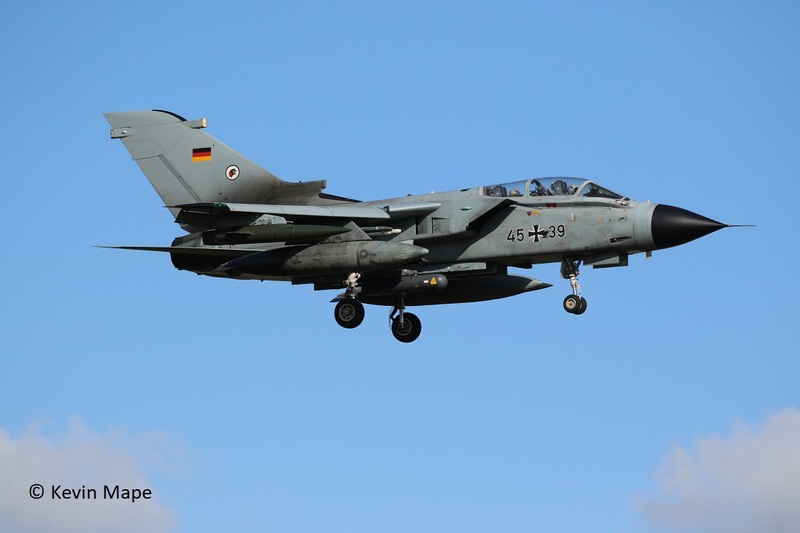 46+55/TLG 51/Tornado ECR c/s “German Air Force mike 51” – New arrival. ZF239/239/1FTS/Tucano T1 c/s “Lima 54” – Overshoot. 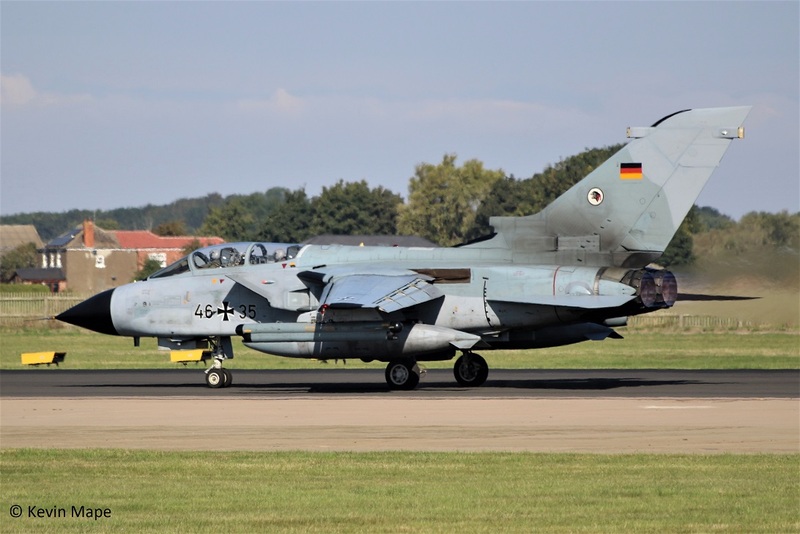 45+39/TLG 51/Tornado ECR c/s “German Air Force mike 51” – Returned to Germany. PA474/BBMF/Lancaster c/s “Lancaster 99” T&G and display. ZA679/ Chinook HC5 c/s “Vortex 536” – Parked on Sierra – Departed after dark. 13th Thur Log thanks to Rob Yates. ZJ800 Fuselage and wings departed to Bae training school at Humberside Airport. ZK309/309 code only – Towed from TMF to the old paint shop. G-MAJA/JA/Eastern/Jetstream 41 c/s “East Flt 105” in “106” out. 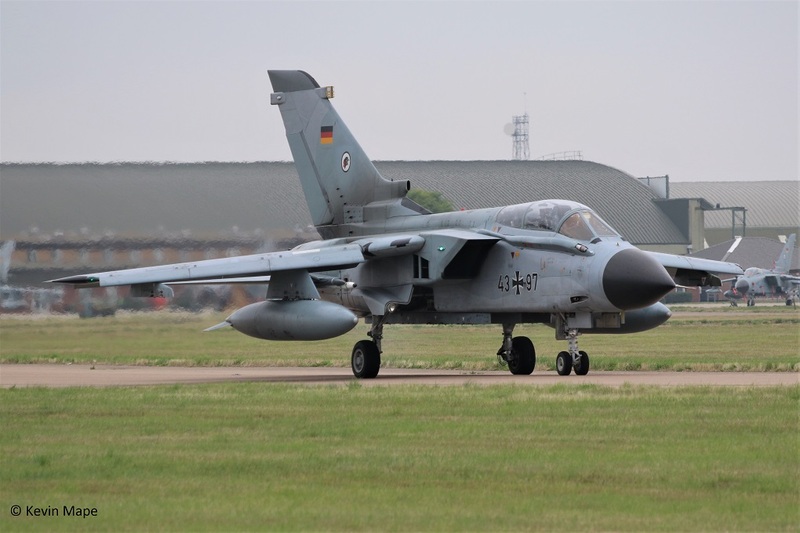 46+40/TLG 51/Tornado ECS c/s “GAF M52” – Returned to Germany. 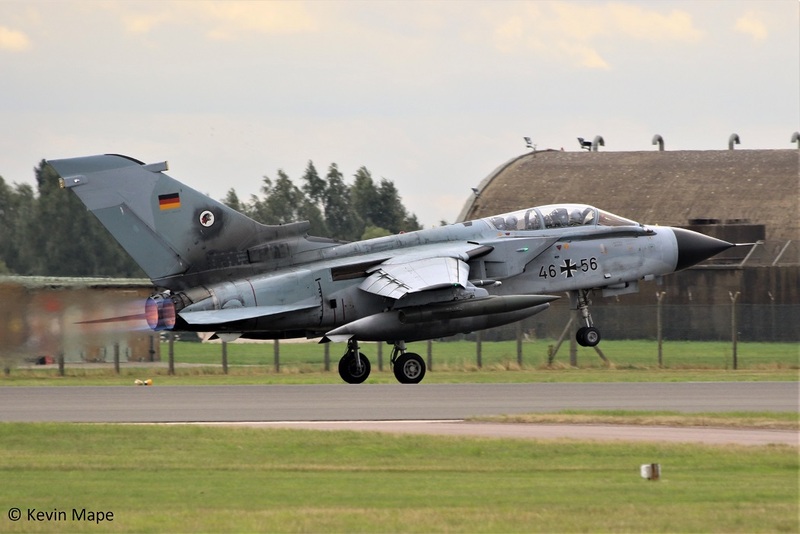 45+56/TLG 51/Tornado ECS c/s “GAF M53”- Returned to Germany. 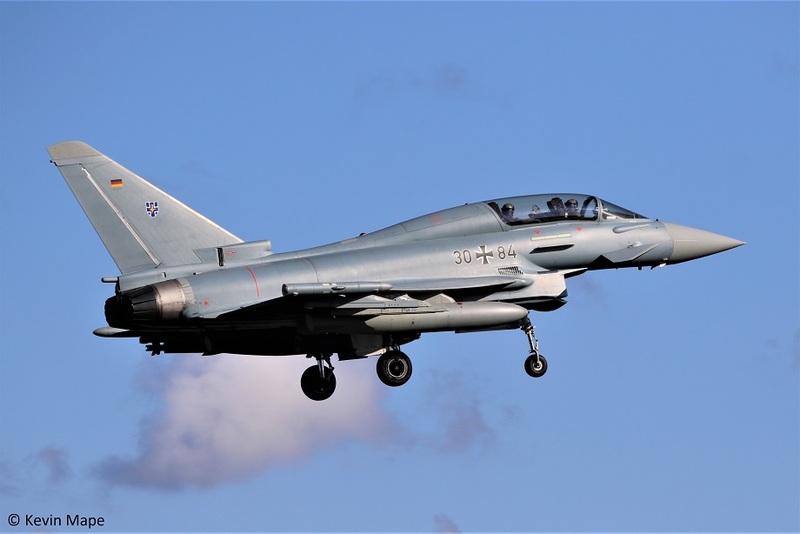 30+84/TLG73/EF2000B c/s “GAF S 01A- Returned to Germany. 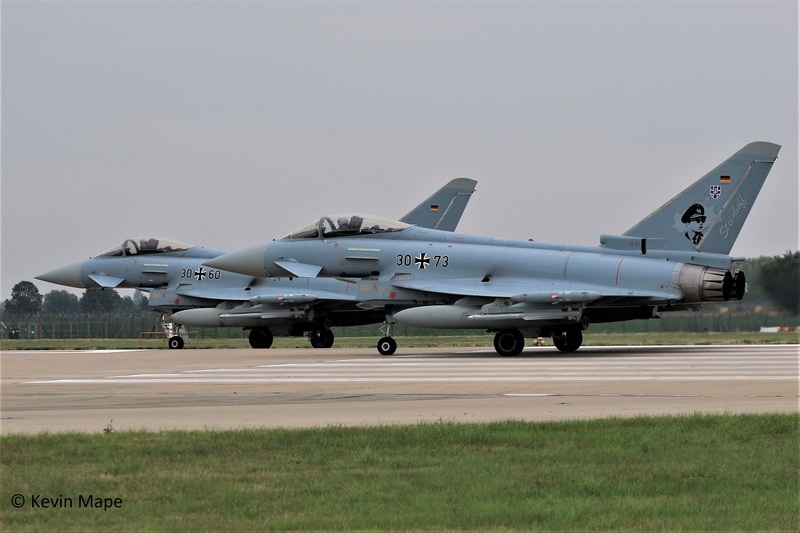 30+46/TLG73/EF2000A c/s “GAF S 01A- Returned to Germany. 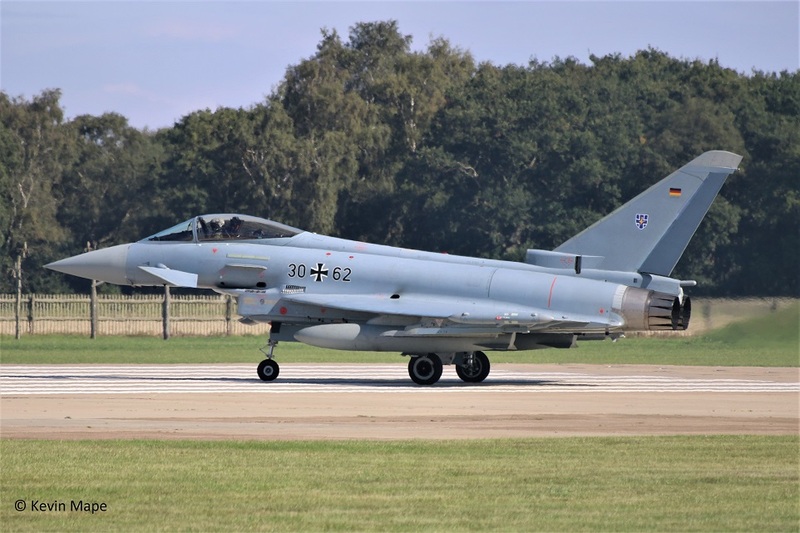 30+49/TLG73/EF2000A c/s “GAF S 01A- Returned to Germany. 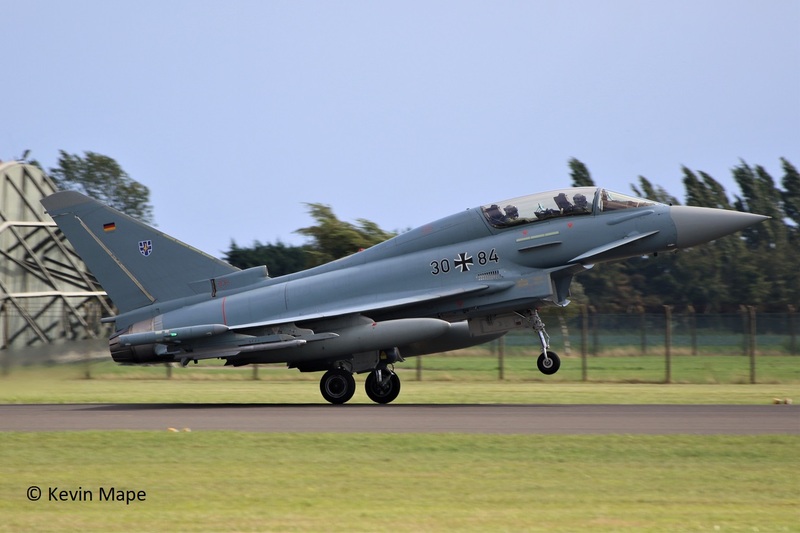 30+60/TLG73/EF2000A c/s “GAF S 02A- Returned to Germany. 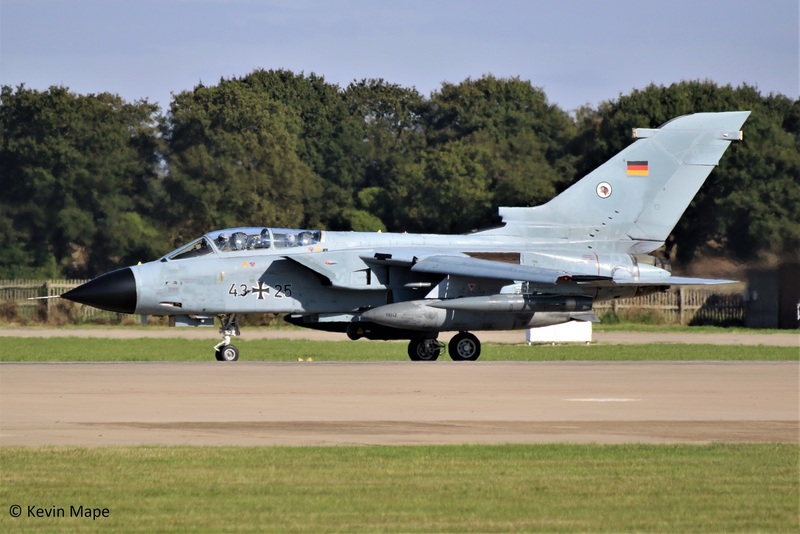 30+62/TLG73/EF2000A c/s “GAF S 02B- Returned to Germany. 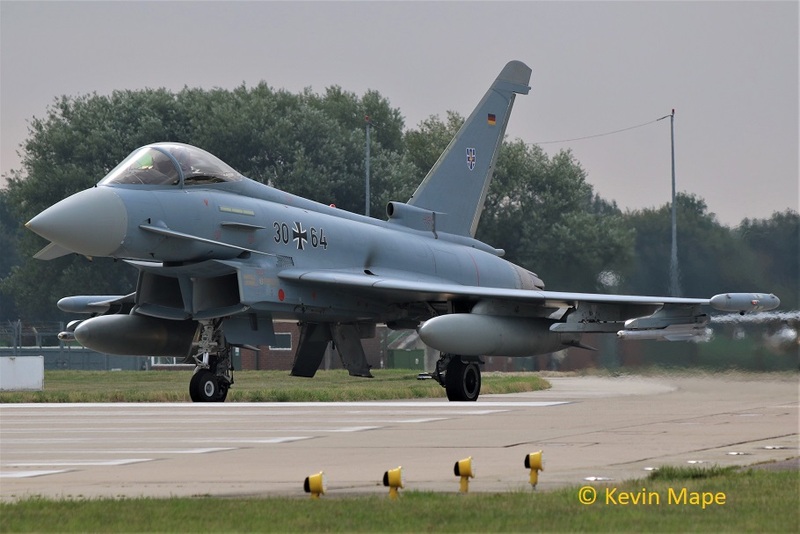 30+64/TLG73/EF2000A c/s “GAF S 02C- Returned to Germany. 30+73/TLG73 Special /EF2000A c/s “GAF S 02D- Returned to Germany. 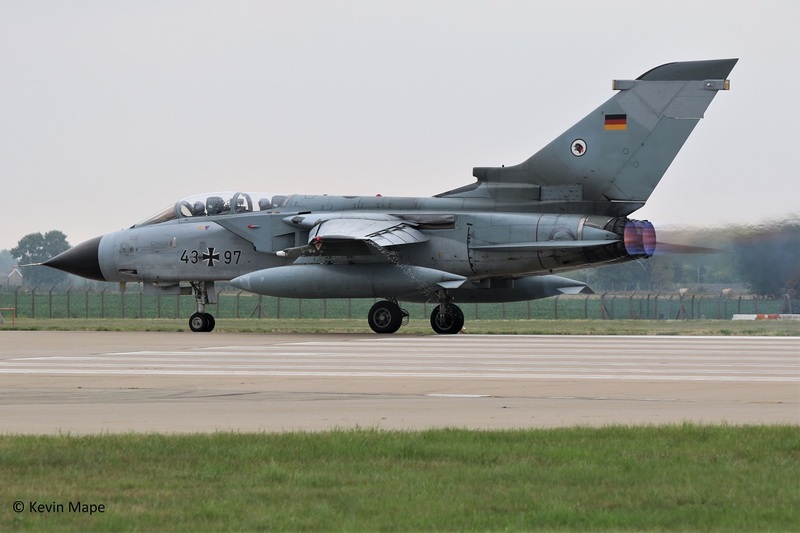 46+36/TLG 51/Tornado ECS c/s “GAF M57”- Returned to Germany. 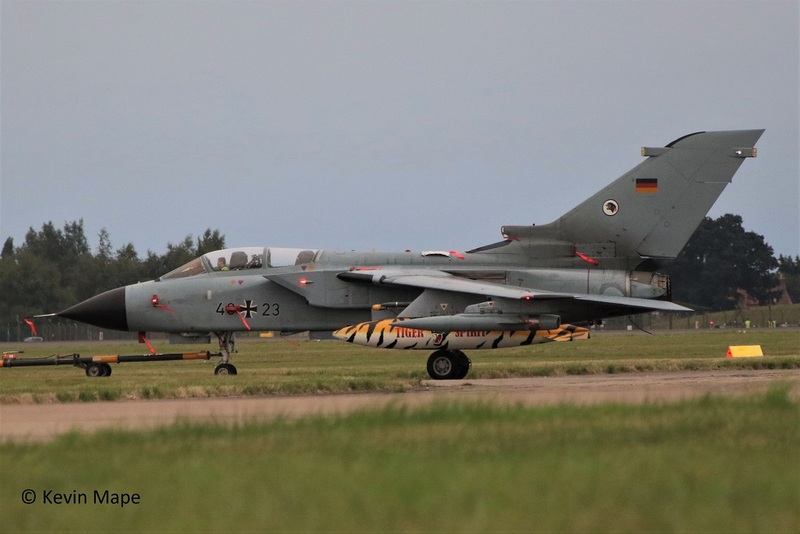 43+25/TLG 51/Tornado IDS c/s “GAF M55”- Returned to Germany. 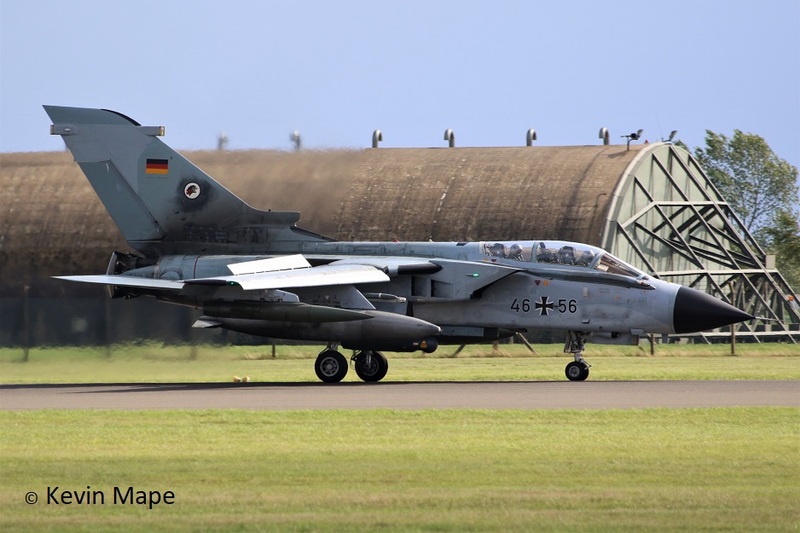 46+55/TLG 51/Tornado ECS c/s “GAF M56”- Returned to Germany. 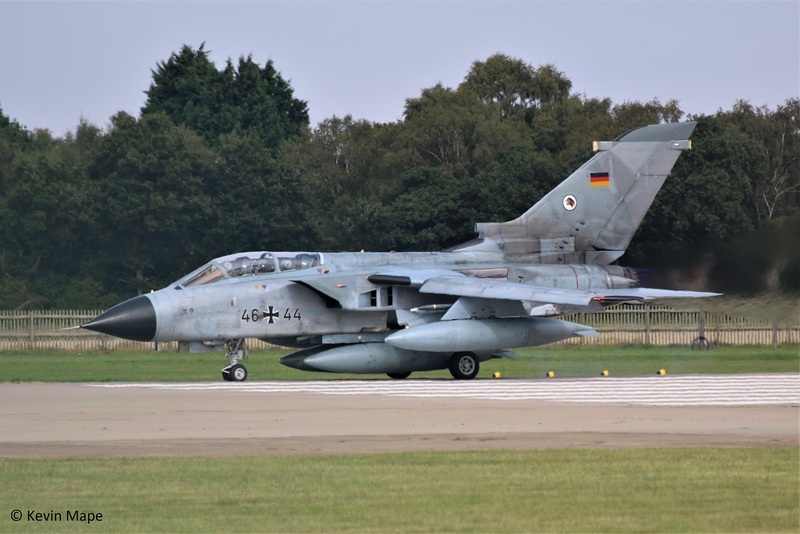 46+44/TLG 51/Tornado ECS c/s “GAF M54”- Returned to Germany. 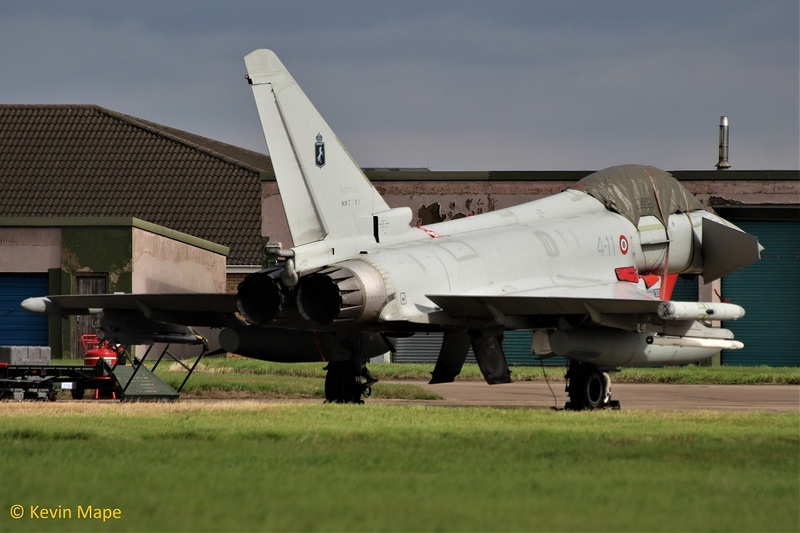 ZK318/RAF 100 tail c/s “Typhoon 23” – To Duxford & return. TE311/SZ-G/BBMF/Spitfire LF XVIe c/s “Memorial 2”- To Duxford & return. ZJ931/931 code only c/s “Warlord 1”- To Duxford & return. ZK371/Unmarked – noted on the ASP. 24th Mon Log thanks to Garf & Hans – Jurgen Breuer. ZK430/430 code only – Towed from TMF. 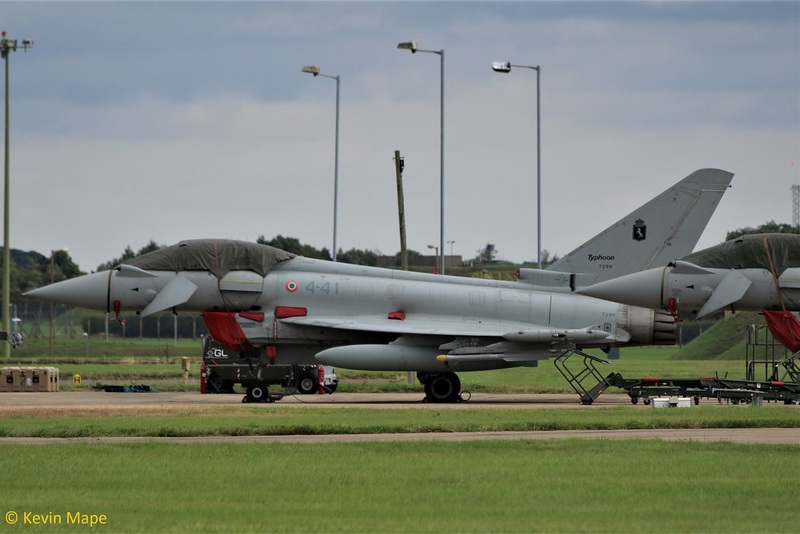 ZJ919/919 /6Sqn c/s “Typhoon 13” To Lossiemouth from Foxtrot. ZK379/379 41(R)TES – Noted on the Wash Pan . ZK323/Unmarked c/s “Lossie 85” – Delivery to Lossiemouth. ZJ928/928 code only c/s “Warlord 11” – PD Waddington. 1830 Hrs noted on the ASP. 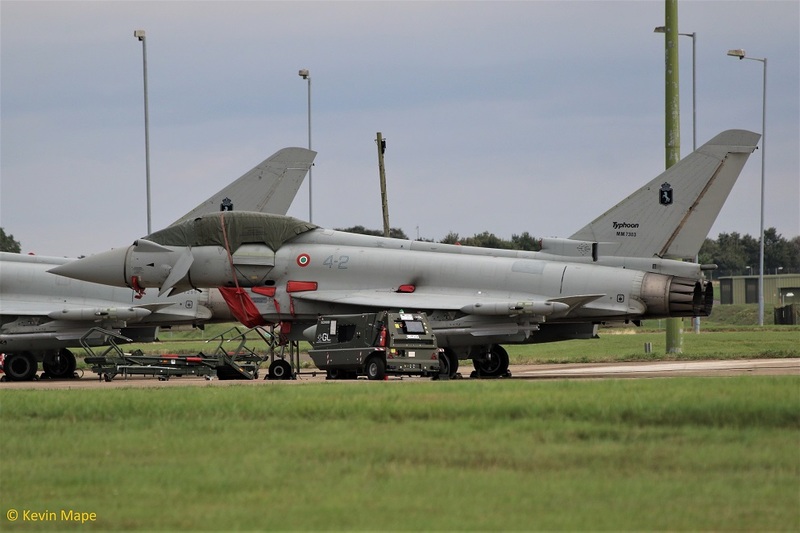 ZK343/343/29(R)Sqn – Towed from Hangar 1 to TMF. 25th Tue Log thanks to Steve & Val & Hans – Jurgen Breuer. ZK374/374 code only – Towed from TMF to the Wash pan. ZK354/354/XI(F))Sqn – Towed to the Wash pan. ZK361/361 code only – noted outside HAS 1 for QRA duty. ZJ929/929 code only – towed from HAS 1 back to Foxtrot for 3(F)Sqn. ZM147/617Sqny /F-35B Lightning II c/s “Marham 87” – Overshoot. “Warlord 11 ,12,13” – all 3 ground abort. ZK431/Unmarked c/s “Tarnish 29” – Delivery from Warton. G-BYVR/VR/Tutor T1 c/s “Wittering 49” – Overshoot. 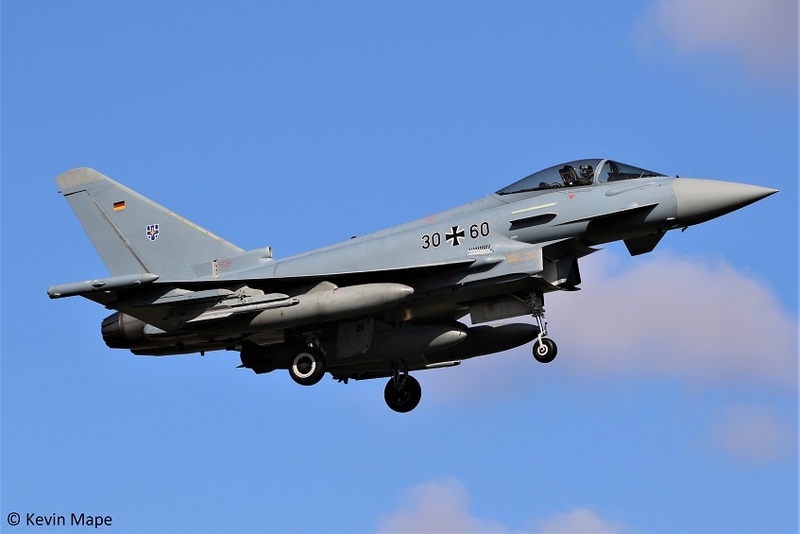 ZK358/358 code only – QRA radio check. ZK361/361 – towed from HAS 1 to HAS 2. ZK346/346code only – Towed from Echo to Hangar 2. 26th Wed Log thanks to Garf & Hans – Jurgen Breuer. 41 SQN – ZK379/379/ZK375/375,ZK376/376,ZK365/365 All with 41(R)TES marks. ZK343/343/29(R)Sqn Towed TMF to APU tunnel – 0900 Hrs! MK356/QJ-3/BBMF/Spitfire LF IXe c/s “Battle 1” – Display. ZK381/381/code only c/s “Rafair 7000” – Departed with . ZF338/338/1FTS/Tucano T1 c/s “Lop 16” – Parked on Sierra. ZF407/407/1FTS/Tucano T1 c/s “Lop 26” – Departed. ZF338/338/1FTS/Tucano T1 c/s “Lop 16” – Departed. ZK354/354/XI(F)Sqn – Towed from Echo to the TMF. Wash pan – ZJ916 /916 code only. Echo – ZK301/301 code only. 27th Thur Log thanks to Hans – Jurgen Breuer. ZJ931/931 code only – Towed to the Wash pan. Base was closed to flying. G-BMFD/Pa-23 Aztec c/s “GMF” – Photo ship – Parked on the ASP. G-BMFD/Pa-23 Aztec c/s “GMF” – Photo ship. What a great event to the end of the BBMF 2018 season, Roll out the Chippy’s.